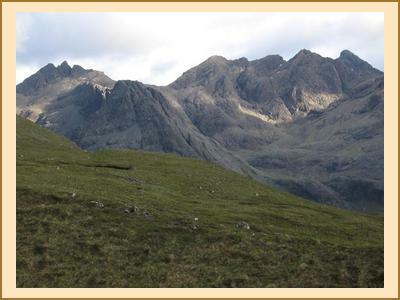 The Skye meet in 2013 had been cancelled due to phenomenal amounts of rainfall; this year’s meet coincided with the Whit weekend and some fantastic weather and attracted enough members to comfortably fill Kenny and Alison’s tent (shoes off at the door, please) at Glenbrittle campsite. Saturday saw Kenny, Martin, Alison C, Chris, Fiona M and someone’s dog heading to sea cliffs at Neist Point. Tim, Claire, Antti, Pauline, Dave and the ‘Glasgow Girls’ (Alison G, Carla and Rebecca) climbed into Coir’ a Grundha and negotiated the scrambles between Sgurr Dubh an Da Beinn, Sgurr Dubh Mor and Sgurr nan Eag in increasingly fine weather. Tim, Antti and Claire opted for the long walk out via Gars-bheinn; the others retraced their steps and a bit of scree-skiing later the two groups met up again on the walk out. Claire and Antti cracked open the barbecue whilst others cracked open a bottle of something for Ali G’s birthday. The weather on Sunday started suitably dreich to permit a late start (apparently this is acceptable in Skye) and Kenny, Alison, Claire and Antti headed up to do the Coire Lagan circuit of Sgurr Sgumain, Sgurr Alasdair, Sgurr Thearlaich, Sgurr Mhic Choinnich and Sgurr Dearg. My own reticence to attempt even the second Munro let alone the In Pinn turned into a full-scale effort to catch up with the nimble-footed Kenny once the cloud had retreated a little, and it was a triumphant group that returned to the campsite for (a few) beers that evening. I did make a headcam video of the ascent but I am no Spielberg and the preview bombed. Tim climbed Sgurr nan Gillean but decided against the West Ridge to Am Basteir due to the weather. Alison G and Rebecca tackled Bla Bheinn and Carla had a quiet day around the campsite and went for a long run that didn’t quite turn out as initially planned. Martin, Chris and Fiona M made a foray up Bidean Drum nan Ramh, which Martin tells me means ‘hill of the oars’ given the shape made by the twin spurs of Drum nan Ramh and Sgurr an Fheadain when viewed from above. 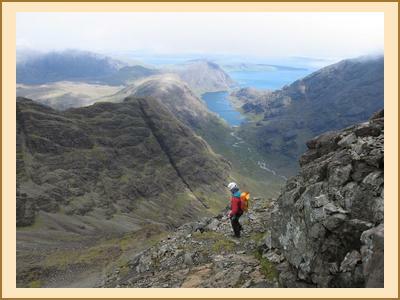 Their day involved lots of scrambling and a return via Sgurr a’Mhadaidh. Pauline and David turned back from their walk due to poor weather but more than made up for it with a 3.5-Munro assault on Monday (and thereafter a week with a minimum of one Munro every day). The second EMC weekend in a row resulted in a two-pronged approach, with Alison, Kenny, Margaret, Gillian on Harris. John and Agnes Watson made a surprise but welcome appearance too. Myself and Antti, returned from a 3 day backpack at Seana Bhraigh and Beinn Dearg, plonked our oversized tent somewhere at Gairloch campside and over two days waves of EMC folk came and went: on Friday night Fiona C had worn herself out hillwalking for the week; Pauline and Dave showed no signs of giving up the Munro bagging after some Cuillin, Fannaich and An Teallach action; Aga and James came up from Edinburgh and determinedly had a bbq at 11pm. Saturday was a stunning day; C&A strolled up Ben Alligin, Aga and James managed a climb and the others reluctantly headed back to Edinburgh to be replaced by a mildly exhausted Chris (fresh off the hill after the Mullardoch round and Fisherfield hills and with only one Munro left to bag); and Alan H who had been fishing on Loch Damh. We had a double-strength BBQ with fresh meat from the fab butcher’s in Gairloch and I must admit to being impressed at the speed with which Chris gulped a couple of pints. The dance tunes in in the Millcroft Hotel were just a bit too lively and true to EMC form we were all in bed by midnight. Rain set in on Sunday. A good weekend, rounding off a fantastic week.